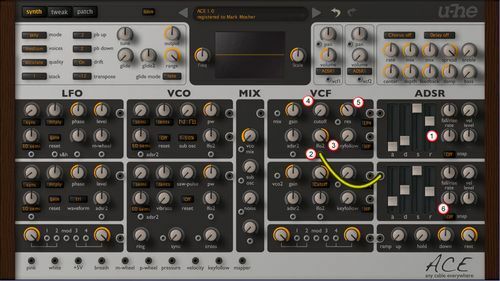 U-HE ACE is my favorate analog modeled virtual synth and once you “grok”” the cabling you can do amazing things with it. If you find the cabling confusing, checkout my video from last year “U-HE ACE Tutorial: Patch Cables 101” which I’m happy to report is closing in on 12,000 views. Via a YouTube I got a question from a reader on how to modulate the filter with an envelope so I thought I’d put together a quick step-by-step tutorial. Click the image above to see a larger version to follow along. Patch a cable from the output socket of ADSR2 to the socket under LFO2. Now the knob for LFO2 turns into a bi-polar gain knob. Tweak to your heart’s desire.